Add one "beta" icon from testing applications. Speed up the page loading by optimizing both front-end and back-end code. Discriminate the library/API/toolkit from the knowledge graph and put them aside the knowledge graph in the website so that users can have a clearer view. Get more categorizations of tags and then list them aside the knowledge graph. 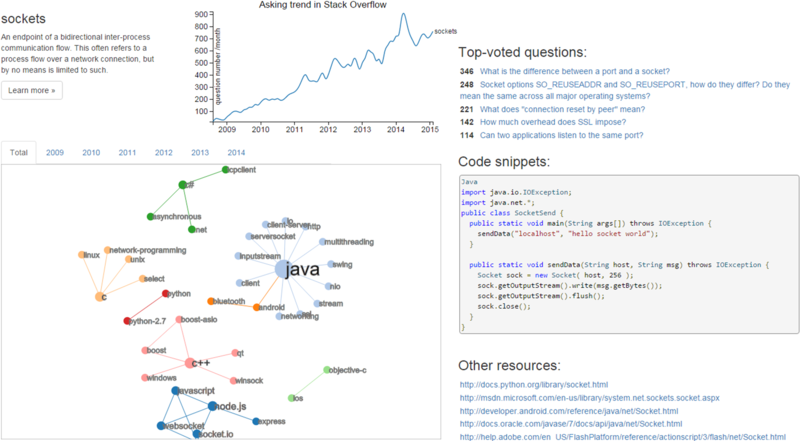 This is a website providing an overview/landscape of certain tech (tag) in Stack Overflow. You can explore this site to enrich your knowledge and refine what you need. experts of it with their knowledge graphs rather than a list of tags (experts are selected by reputation score and whether their answer number is enough to generate knowledge graph). Given multiple tech/tags, they will be compared in both asking trend and knowledge graph. In addition, you can also specify a task and a programming language to see a knowledge graph which may provide some hints or solutions to the tasks. The Service is still in construction and more functions will be added in the future. All are free. Browse other questions tagged app website search .